2 x TLKR T82 radios. - Up to 10km range (subject to terrain and conditions). - Battery level indicator. - Weight: 197 grams (with belt clip and battery. All features listed below. - 20 call tones. - Group Call. ). Frequency range:PMR 446MHz. 2 x Floureon A5 walkie talkies. Digital Car DAB Radio Adapter Receiver Tuner Antenna FM Transmitter Bluetooth UK. USB DAB Digital Radio Tuner USB Dongle for XTRONS Android 7.1/8.0/8.1 Car DVD. Perfect for hunters, hikers, adventurers, anyone who works out doors and so many more applications. With its massive range of up to 10km (subject to terrain and conditions) the TLKR T81 is well suited to the many challenges of the outdoors and features several helpful features to make the most out of its presence, such as its hands-free operation option, lanyard, and included carrying case. Frequency Band: PMR 446MHz. 2 x FLOUREON FC200 walkies talkies. Bring your family & friends closer to nature, and keep them connected. Have a retreat from the daily hustle and bustle, go outdoor, camping, hikin or simply rambling in the woods. Floureon Battery. FLOUREON 8CH 5IN1 1080P 1080N HDMI H.264 CCTV Security Video Recorder Cloud DVR. 4 FLOUREON FC200 walkies talkies. Frequency Band: PMR 446MHz. Bring your family & friends closer to nature, and keep them connected. Channels: 16CH 121 Privacy Codes. There's even a convenient belt clip to attach your two way radio walkie talkie when not in use, a cool LCD backlit display and a LED lamp. Bring your family & friends closer to nature, and keep them connected. Channels: 16CH 121 Privacy Codes. There's even a convenient belt clip to attach your two way radio walkie talkie when not in use, a cool LCD backlit display and a LED lamp. Tablet PC&TV Box. Freedom of being there, free from the worry of losing sight of each other, talk among yourselves across distance up to 5 KM / 3.1 miles, Privacy Codes makes talk more secure and less interrupted. 2 x Portable Baofeng radio. Antenna Impedance 50. Chinese/English Voice Prompt. Battery saving function. Channel Capacity 16. Current ≤1000mA. current ≤100mA. Motorola GP340 VHF handheld transceiver. Genuine Motorola VHF aerial and accessory (dust) cover. Option Board Expandability. X-Pand Voice Compression and Low Level Expansion. Voice Operated Transmit (VOX). 2 x Retevis RT24 walkie talkies pmr 446. What is PMR446?. Long Range and Long Standby. Weight: 193g (battery included) per piece. Size: 230 62 34mm per piece. Frequency range:PMR 446MHz. 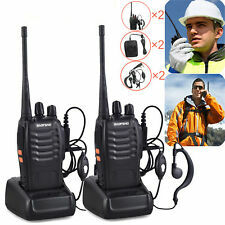 2 x Floureon A5 walkie talkies. Jump Starter. 4-Mans Camping Tunnel Tent Outdoor Hiking Traveling Tent Beach Festival Shelter. Computer & Network Accessories. Motor Accessories. 2 x Baofeng T1 Mini Walkie Talkie. BAOFENG T1 Radio. Hot Baofeng Model. Frequency Range : UHF 400-470MHz. Frequency Bands : UHF. Frequency Range UHF: 400-470MHz. Banda di frequenza(s): UHF. ♢ YN600EX-RT II. 6 x Walkie Talkies. USB Two-way Radio Walkie Talkie Free Headsets£34.99. Prevent users from receiving unauthorized signal and avoid the interference channel. Protect sound from the interface of signal. Built-in Led torch: Yes. 4 x Headphone. This radio is helpful for the following circumstances: security guard, supermarket connection, construction area indication. It is also helpful for field survival, biking and hiking. 10 x Walkie Talkie. USB Two-way Radio Walkie Talkie Free Headsets£34.99. Battery Life Theory: 10000 Hour. Prevent users from receiving unauthorized signal and avoid the interference channel. Protect sound from the interface of signal. Walkie Talkies. UHF 400-470MHz. Do Not Want Refurbished?. BUY NEW BELOW ! 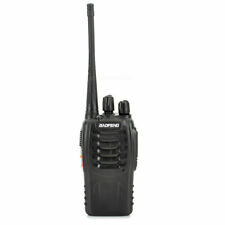 1 x Refurbished Baofeng/Pofung BF-888S. Spurious Response. Weight (with battery/antenna). (with battery,without antenna). This is a pair of Kenwood ProTalk PMR446 portable radios. Radio 1 - Kenwood TK-3301. 4PCSWalkie Talkies 2 Way Radios Long Range PMR446MHZ 16CH Interphone Intercom. 2 x FLOUREON FC200 walkies talkies. Frequency Band: PMR 446MHz. Channels: 16CH 121 Privacy Codes. There's even a convenient belt clip to attach your two way radio walkie talkie when not in use, a cool LCD backlit display and a LED lamp. 2 Pack Baofeng bf-888s Walkie Talkies Long Range Recharegeable Two Way Radio Set. Walkie Talkies. UHF 400-470MHz. 3 x Baofeng/Pofung BF-888S (UHF 400-469.995Mhz). Spurious Response. Weight (with battery/antenna). (with battery,without antenna). 3 x Wrist Strap. Antenna Impedance. Fully featured, tough and stylish, the TALKABOUT TLKR T62 walkie-talkie is the ideal way to stay connected during outdoor adventures. Just Simple Push To Talk Radios. 3 x Walkie Talkies. - Frequency Range: UHF 400-470MHz. -Battery Life Theory: 10000 Hour. When and where do you need this radio ?. - Monitor Function: Yes. -Channel: 16. - Antenna Impedance: 50Ω. 6 pcs Walkie Talkies BaoFeng 888S 2 Way Radio UHF 400-470MHZ 16CH Long Range UK. BaoFeng BF-888S UHF 400-470MHZ 16CH Two Way FM Ham Radio Walkie Talkie Headset. Walkie Talkies. UHF 400-470MHz. 1 x Baofeng x BF-888S Plus (UHF 400-470Mhz). NEW Mini Radio BF-T1. Health & Beauty. RF Rated Power. Frequency Band: PMR 446MHz. 2 x FLOUREON FC200 walkies talkies. 2PCS FLOUREON 18V 4.0Ah Battery for DEWALT 18V DCB200, Cordless Drill Driver Saw. There's even a convenient belt clip to attach your two way radio walkie talkie when not in use, a cool LCD backlit display and a LED lamp. 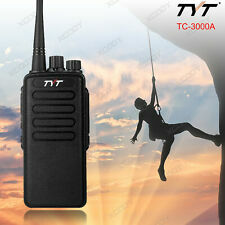 2 X Proster 16ch Walkie Talkie Long Range UHF 400-470mhz Way Radio. Dispatched with Royal Mail 2nd Class. Opened but used. * USB RECHARGEABLE --- These Walkie Talkies Are Rechargeable And Comes with The USB Changer. * 16 CHANNEL --- With 16 Channels to Be Chosen. Easy to Use, All You Need Is Just Turn These Two to The Same Channel, Then Push A Button. * LED FLASHLIGHT --- Built-in LED Flashlight That Can Be Used As Emergency Light, Which Is Very Convenient. * WIDE USE --- Suitable for Security Guard, Supermarket Connection, Construction Area or Field Survival, Biking and so on. * 2 MILES --- Enables to Connect Each Other in A Long Range of About 2 Miles (Max in OUTDOOR Open Field, It Exactly Depends on Your Surroundings). 8 x Sunreal BF-888S Rechargeable Long Range Two Way Radio - Free P&P IRE & UK!